Adriel Jeremiah Green was born on 31st July 1988, in Summerville, South Carolina USA, and is a professional American Football player, in the position of wide receiver. He has been playing in the team of the Cincinnati Bengals in the National Football League (NFL) since 2011. Since then he has been selected for the Pro Bowl every year. Green alongside the team was named Second-team All-Pro twice (2012, 2013) and PFWA All-Rookie Team (2011). How much is the net worth of A. J. Green? It has been estimated that the overall size of his wealth is equal to $35 million, as of the data presented in 2016. To give example of his earnings, he received $11.7 million as a salary as well as $15 million as a contract signing bonus from Cincinnati Bengals. To begin with, Green was educated at Summerville High School in which he played football, basketball and was a successful athlete; he was listed as the best player of his age by Sports Illustrated, achieving the second best ever scoring record as a high school football player. Later, he joined the team of the University of Georgia, where he played from 2008 to 2010 representing the Georgia Bulldogs team. Regarding his professional career, Green was selected fourth in the first round of the NFL Draft 2011 by the Cincinnati Bengals. In his rookie season he broke the franchise record of catching passes for more than 1,009 yards, the record previously made by Chris Collinsworth in 1981. In addition, he alongside Andy Dalton presented a new NFL record for pass catches. After the season, he became the first rookie wide receiver selected in the Pro Bowl since 2003. In 2012, he set a personal best when he made nine passes for 183 yards winning 38-31 over the Washington Redskins. In 2013, he set new records in pass catches (98) and caught yards (1,426), scoring eleven touchdowns. He also had six 100-yard games, including five in a row, which is a Bengals franchise record. In the season of 2014 he missed three games due to a toe injury, and still came to over 1,000 yards and six touchdowns for the season – moreover, he missed the play-offs. 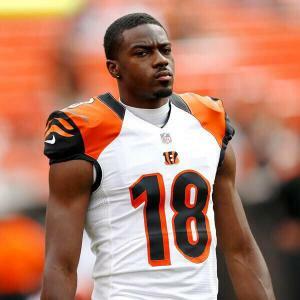 In 2015, Green signed with the Bengals for a four-year contract renewal valued at $60 million, which has significantly increased the outright size of A. J. Green net worth. The Bengals began the year by winning the first eight games, a new franchise record. Green received for 227 yards and two touchdowns, and was named as the AFC offensive player of the week. He again scored two touchdowns in the twelfth round in which Cincinnati beat the Rams to 31-7. At the end of the season, Green was called up for his fifth Pro Bowl. According to the NFL statistics given in 2015, Green has so far 415 receptions, 6,171 receiving yards and 45 receiving TDs. Overall, football is the main source of A. J. Green net worth. Finally, in the personal life of the professional football player, Green married Miranda Brooke in 2015.